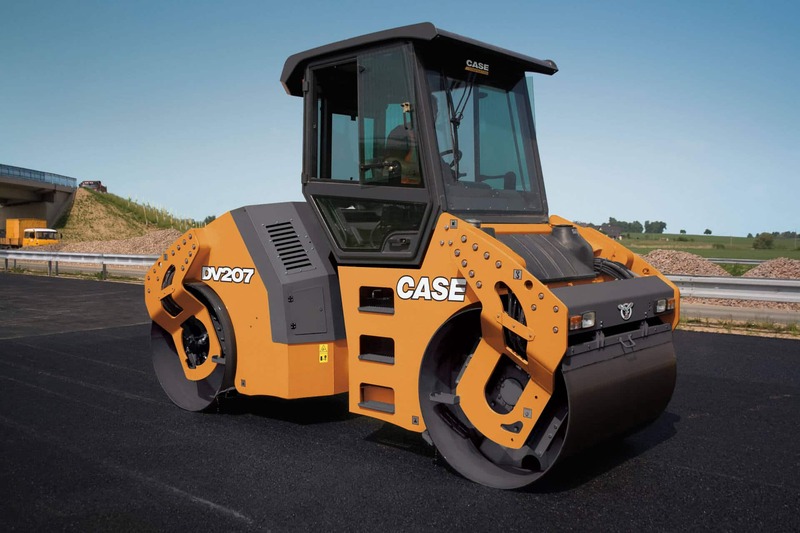 The CASE DV207 large asphalt compactor delivers 100% traction efficiency and eliminates slippage on the compacted surface with its direct-drive independent pumps for each drum. From dual amplitudes and dual frequencies to centrifugal forces, the durable DV207 offers the best possible compaction productivity and performance. 100% traction efficiency and zero slippage on compacted surfaces are delivered by our CASE Dual Drum Drive. Productivity is maximized on coarse bases and hot-mix asphalt surfaces with high centrifugal forces and dual amplitudes. Surface damage is minimized while delivering smooth pavement due to automatic vibration control. Keep comfortable even on rough surfaces with the vibration-dampening, isolation-mount work platform. Operators get a full view of the compacted surface through a multi-position station and 180° of swivel seat positioning. Illumination is improved via standard front and rear-facing halogen lights.